When will Governor Cuomo act to end racism in his corrections department? Spotlight: When will Governor Cuomo act to end racism in his corrections department? The questions of timing cannot be delinked from Cuomo’s political ambitions. During her primary campaign to unseat the governor, Cynthia Nixon pledged to end solitary confinement through executive action and to support the HALT Solitary Confinement Act, legislation that would eliminate long-term solitary in New York. She also promised to expand on the “marginal improvements” to the parole process under Cuomo. Nixon’s challenge forced Cuomo to swerve left on a number of issues, including marijuana legalization and voting rights for people on parole. After his primary victory, Cuomo expanded on a favored theme, saying, “You cannot have the word progressive without progress,” and, “I am progressive, I deliver progressive results.” Now, with his primary victory secure, facing a little-known challenger in the November election, and any presidential campaign several years away, the question is whether Cuomo will turn that conviction about delivering results toward ending racism in his corrections department. 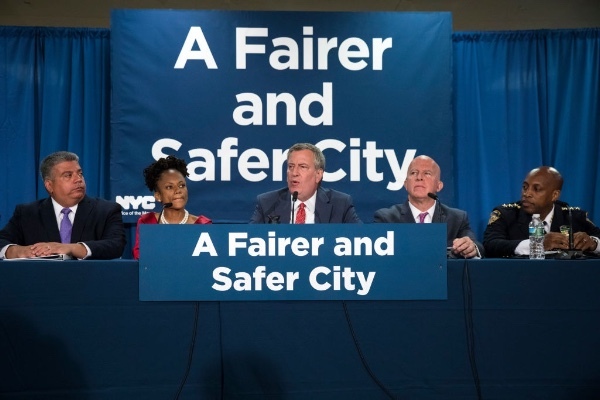 Brooklyn District Attorney Eric Gonzalez (left), community organizer Monique Waterman, New York City Mayor Bill de Blasio, New York City Police Commissioner James O’Neill and NYPD Chief of Patrol Rodney Harrison held a press conference in June to announce a new policy that they said would reduce unnecessary marijuana arrests. 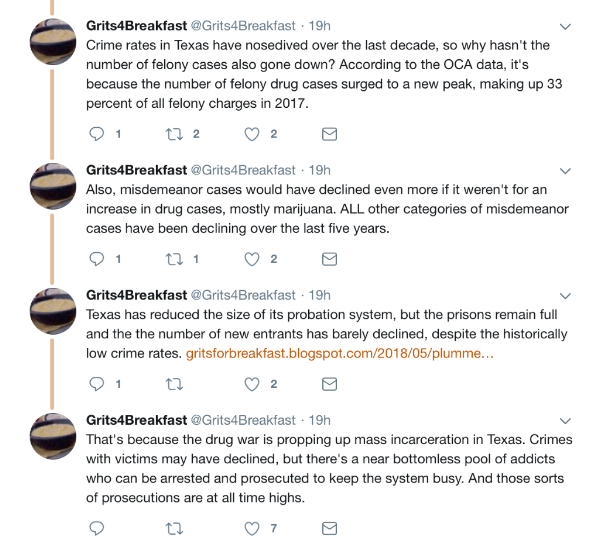 Drug prosecutions keep Texas prisons full: The Twitter account for the Texas criminal legal reform blog Grits for Breakfast looks at the 2017 data from the Texas Office of Court Administration, which shows that the number of misdemeanor cases statewide has “plummeted” over the last decade but the number of felony prosecutions has remained constant. The reason is the number of felony drug cases, which is higher than ever. Correction: In Monday’s newsletter, the “In the Spotlight” feature about media and police portrayals of Black victims of police shootings misstated the name of an attorney for Botham Jean’s family. He is Lee Merritt, not Lee Merritt Jr.